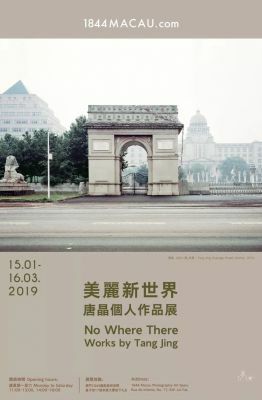 1844 Macau Photography Art Space has the honour to invite photography artist Tang Jing, to hold ‘No Where There – Works by Tang Jing’ from 15thJanuary to 16th March in 2019 at 1844. ‘No Where There’ is a series of images photographed by Tang Jing since 2013. The artist selects the shooting places through careful selection and research. The creation process includes interviews, video recordings and on-site experiences etc. ‘No Where There’, which means ‘beautiful new world’ in the Chinese title, is inspired from one of the three most famous dystopian novels, ‘Brave New World’ (1932) by the English author Aldous Huxley. It is a novel set in London in 2540CE, depicting the writer’s imagination about the future of the high-techcivilization, where there was no pain, but happiness. The novel depicted how such a ‘perfect world’ has brought huge influences on the mental world of people and their social civilization, the novel profoundly reflected the relationship between individual and collective, as well as the problems between freedom, order and conditioning. Could one world become the reflection of another world? Is Utopia more of a dreamland or a perceptual dissociation? With the advent of such concept, people started to change their society into an imaginary perfect world. Therefore, urban architecture became something that people could start with. Architecture cannot change our cities, but it reflects people’s social demands for aesthetics. Since 2013, I have photographed many replicated European-style buildings in China’s different cities. They are not like World Park, hotels or outlets where people can only entertain their fantasies just for moments. Since the function of consuming places is to satisfy people's desires and to stimulate any demands of consumption, the construction of such place will not be extended to the dislocation of cultural and social problems. I photographed these buildings in public space, trying to discuss the role of people in society through architecture: Who built these buildings? Who uses them? What was the aesthetic view of the people who built them? Through this group of works, I want to discuss architecture and power, and the relationship between architecture and aesthetics, that is, whether or not aesthetics has influences on our society. At the same time, these images represent the difficult situation of culture. Chinese traditional culture has lost its aesthetic paradigm after the great rupture in contemporary society. Direct usage of the classical architectural forms into constructions, replication of colonial architecture and outsourcing design tasks to foreign designers. After different trials and attempts, I have never been able to find my own position - what kind of aesthetic and architectural values can support the current China? The issues reflected in each piece of work is different and worth discussing. Therefore, I do not hold a completely negative attitude towards these buildings, nor do I use critical words such as "shanzhai". These replications do exist in our real world. However, I consider them not only as a parody of western aesthetics due to China’s cultural discontinuity, but also a new economic development model. A brilliant new world might become a utopian nightmare like Brasilia, a different Europe, or an imperceptible memory. Tang Jing was born in 1981 in Wuhan, China. He graduated from Hubei Institute of Fine Arts, majoring in sculpture in 2004. He enrolled in School of Fine Arts & Design Kassel in Germany and studied Experimental Photography in 2006. After graduating with a master degree in 2013, he continued his studies and finished his studies as a Meisterschüler in 2015. Tang is now a freelance photography artist. He lives and works in Wuhan. The artist possesses a diversity of perspectives; the expression of his images is not only full of impact but also of realistic and social significance. Through contemplating the current living environment of people, and paying attention to the‘uncertainty in aesthetics’ between objects and reality, Tang recognises the identity of subcultural groups, and re-examines the cultural colonialism in current Chinese architecture. Tang has undertaken and recorded many photography series and topics, including ‘No Where There’, ‘Growth’, ‘Young People’ etc. He has also held many solo exhibitions and curated exhibitions, and participated in a variety of photography exhibitions in China and abroad. Since November 2012, Tang began writing as a columnist in the national photography journal ‘Chinese Photography’ with the ‘Interviews of German Masters of Contemporary Photography’ series. At the same time, he published a bimonthly photography magazine alongside ‘Chinese Photography’, with totally 7 articles, including some important interviews and dialogues such as ‘Photography and China’, ‘Becher and Other than Becher’ etc. He has also held several photography art seminars and lectures in Academyof Fine Arts in Tsinghua University, Wuhan University and other in stitutions.